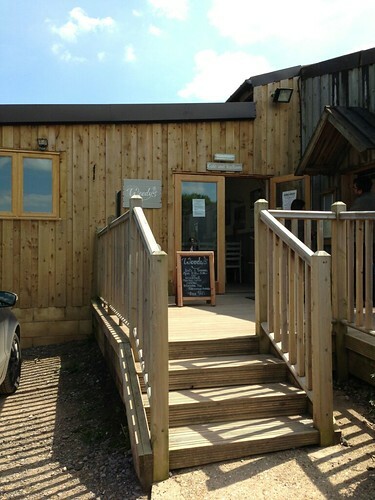 Blogging is never too far from my mind, but when we went on a family day out to Bucklebury Farm Park I didn't expect to find blogging material there, apart from perhaps something tasty being sold in the farm shop. But I was wrong. We pulled up and parked on the grassy verge in the car park, making our way to the farm. Tummies rumbling, we decided to start off with a quick breakfast at Woody's, the restaurant at the side of the farm shop and entrance to the farm. We got there with about five minutes left to order before they stopped serving breakfasts and I found the staff accommodating, helpful and relaxed, which really helped us make our decisions. Nothing like making important breakfast decisions against the clock while the person behind the counter stares at you, with their hands on their hips. And they didn't. 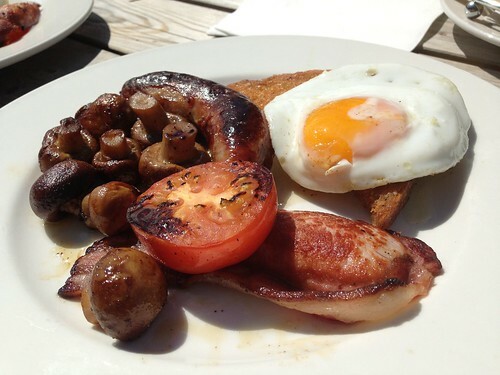 The prices weren't cheap; in the region of £5 for a bacon sandwich and around £8 for a full-English style breakfast. But we were hungry, and took our seats outside in the balmy sunshine. The press is always full of stories about kids not knowing where chicken nuggets come from or what a banana is. But you don't get much more 'hands on' than eating a bacon sandwich with the sound of piggies snuffling and snorting carrying along on the breeze a few yards away. Later on, as we walked around the farm, we saw a calf suckling from its mother, the frothy milk dribbling from its clumsy lips. Now if you want your kids to see where your food comes from, this is the place. A peacock strutted on the grass around the tables while we ate, obviously to see if there were any leftovers he could snaffle up. Hmph. He'd be lucky. The food was excellent. 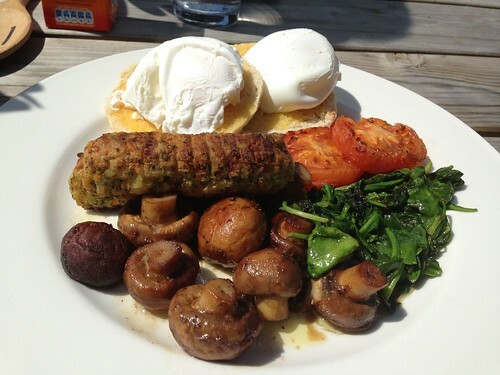 I ordered the 'Green and Gorgeous' breakfast, a proper veggie sausage (made from actual veggies rather than that fake-meat stuff), two poached eggs on a sliced muffin, baked beans, mushrooms, a tomato and some spinach. It's because of this breakfast that I always have spinach, eggs and Glamorgan sausages in the house now, in case I have a craving. I thoroughly enjoyed it. The girls had a smaller breakfast (about £6 each I think, though don't quote me) consisting of sausage, egg, bacon, a fried slice, mushrooms and some beans. The lady at the counter told us it wasn't really a child's sized breakfast but we ordered them anyway, for the husband to finish off if they struggled (they didn't, save a few mushrooms). And he ordered a bacon sandwich, with probably 3 or 4 big, thick rashers of bacon inside. He said it was one of the best bacon butties he's tasted. You tend to put places like Woody's to one side when you go for a day out. They're there out of necessity, in case visitors get peckish and the menu in these kinds of places is usually limited to fried foods, jacket potatoes and sandwiches (a toastie if you're lucky). But here, I'd come back for Woody's just as much as I would for the farm. The farm was a great day out - the children got to feed lambs, stroke goats, guinea pigs and rabbits and play on the play equipment there, and we were there for hours. You can even go for a ride in a tractor if you like. But Woody's at Bucklebury Farm Park isn't one of those places you should bypass. Relaxed staff, good quality food cooked really well and in perfect surroundings. 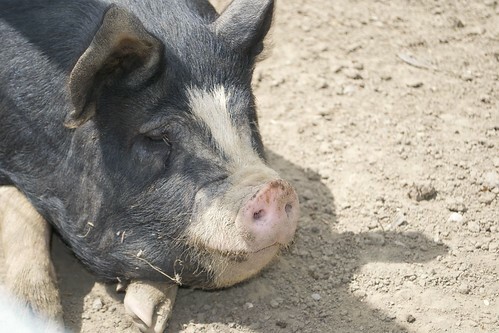 Have you been to Bucklebury Park Farm, or to Woody's? What did you think? More information about Bucklebury Farm Park can be found on their website. They are situated just outside the village of Bucklebury, just off the A4 between Reading and Newbury. Tel: 01189 714002.